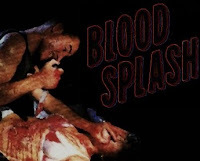 Basement of Ghoulish Decadence: I've been Splashed! Recent follower of BoGD, Starmummy of B Movies and Beyond, has just nominated me for a Splash Award. This award is...errr...awarded to blogs that rock, hence the nod to BoGD. I know this blog rocks; I even look forward to visiting it myself despite being the voice behind it. If that makes any sense. Now, being the rebel I am, I refuse to post a fruity little Mermaid award that probably came from some valley tween's gaudy, seizure-inducing MySpace page. Thus I figured an incredibly distasteful, misogynistic image of a psycho mutilating a woman a fitting replacement. Though I certainly appreciate the gesture and I'm always happy to receive feedback and comments. I wanted to set up a little blog that addresses the things I like (goes without saying, right?) and even though there's many wonderful blogs about the same stuff out there, I felt I could contribute something just a little different here. At least I hope I am. So thanks again and stay tuned! As for selecting other blogs to nominate, I'd suggest digging through my followers like I often do. It's good to network and I'm constantly surprised by what others talk about. I should have started blogging myself years ago! Kudos on the pic. Much better than the fruity mermaid. Are we able to vote for added props and high fives for the site once the nomination is in place? You have my personal nomination for I Like Horror Movies, Carl! sweeeet, but how do I vote for Basement?? Is it a votable thing, I have no idea how it all works? or are all of these blog awards just nominations with a deciding committee? Must.. promote.. awesome VHS blogs..